How to Cook Instant Pot Whole Chicken - Rotisserie Style! 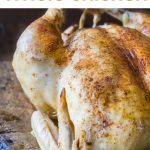 Instant Pot Whole Chicken, cook a rotisserie style whole chicken in your Instant pot or other electric pressure cooker! gluten free, paleo and whole30. 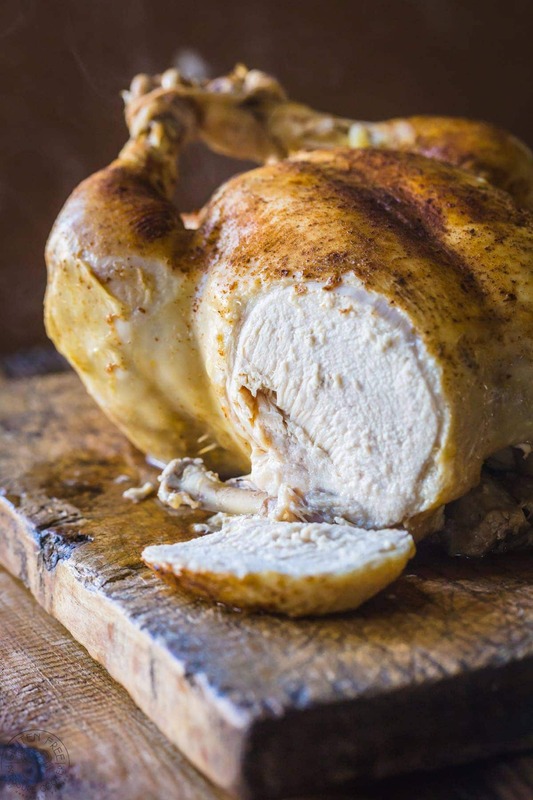 My recipe for Instant Pot Whole chicken is a great alternative to oven roasting your bird. It cooks so much more quickly and the chicken comes out really tender! 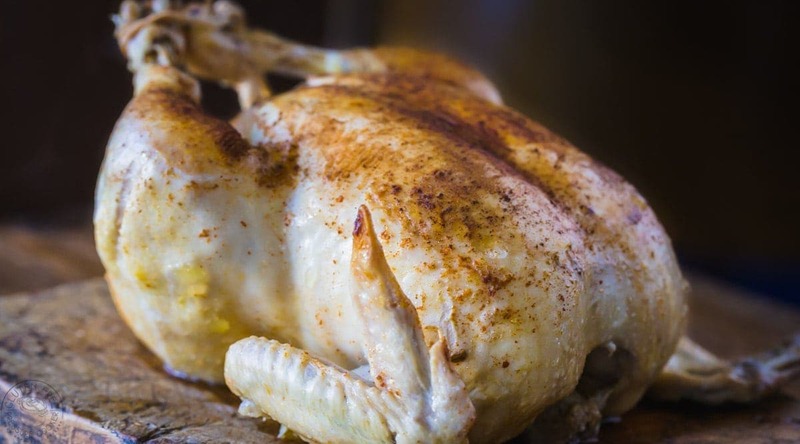 Here are some simple step by step by step directions for cooking a whole chicken in your Instant Pot or other electric pressure cooker, the full recipe is at the end of the post. First, make sure your chicken is fully defrosted and that you’ve removed the giblets so that it will cook through properly. You do not need to rinse the chicken (this only spreads potentially harmful bacteria in your sink and kitchen and does not eliminate it) but you can carefully pat it dry with a paper towel. Now you can apply the simple spice and herb rub which is made up of paprika, thyme, salt, pepper and oil. This adds a little flavor to the chicken and gives the skin a pop of color, otherwise the chicken looks very pale when it’s cooked. If you want to add even more color to the finished chicken then you can carefully brown the chicken before you cook it under pressure. You’re never going to get crispy skin like you will with an oven roasted chicken as we are using steam and pressure too cook it so the skin cannot crisp up in the same way. How long do you Pressure Cook a whole chicken? 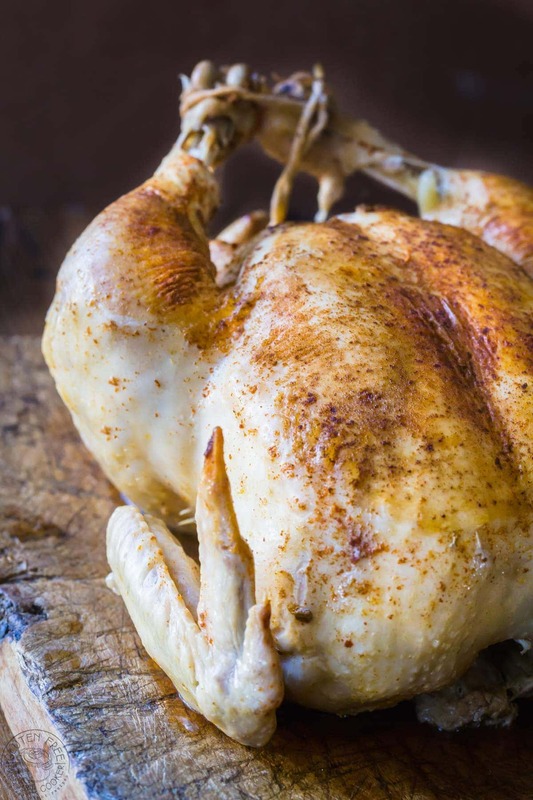 A 4lb chicken can be pressure cooked cooked in about 26 minutes, and a 7lb chicken will take a little longer at around 44 minutes. I have a table below with average cook times. I know some others have done it, but I do not recommend pressure cooking a frozen whole chicken as you risk having the center still frozen even with added cook time. You can cook chicken pieces such as chicken breast and chicken thighs from frozen in a pressure cooker but a whole frozen chicken is more tricky to cook through because of the size. Cook times are approximate and can vary depending on the thickness of the meat, they also assume a fully defrosted chicken. If you are unsure if your chicken is fully cooked then check it with a digital thermometer, it should be at a minimum temperature of 165°F. I have a couple more chicken recipes that you won’t want to miss, pressure cooker Chicken Paprikash has a wonderful smoky flavor and is an easy weeknight meal you’ll love. My pressure cooker Chicken Puttanesca, is fancy enough to serve to guests but very simple to prepare and an easy weeknight dinner. If you want something really, really quick then be sure to try my Pressure Cooker Firecracker chicken recipe, it’s very easy to make. And lastly, my pressure cooker Moo Goo Gai Pan, is another quick recipe. It has a mild sauce, but the vegetables and chicken combined give is a really nice flavor and texture. How to cook Instant Pot Whole Chicken! Mix the herbs, spices, and 1 tbsp oil together in a small bowl. Using a basting brush, brush the mixture onto the chicken. The 'browning' the chicken skin step is entirely optional as by the time the chicken is cooked in your pressure cooker the skin will be soft, not crispy like an oven roasted chicken. Turn on the 'saute' function in your Instant Pot or other electric pressure cooker and add 1tbsp oil. Wait 1-2 minutes for the oil to heat up (don't wait until the display says hot) and then add the chicken, breast side down, until it is browned and no longer sticks to the bottom of the pot, this will take about 5 minutes per side. Once the chicken is browned, turn saute function off and lift out the chicken. Add 1/2 cup water to the pot, then add the small trivet that came with your Instant Pot and sit the chicken on top of it. Lock the lid, turn the steam vent to 'sealing' and using the manual setting, adjust it to cook for 26 minutes at High Pressure for a 4lb chicken, adding approximately an additional 6 minutes per lb for bigger chickens. Your chicken needs to be at an internal temperature of 165°F, you can check it with a digital kitchen thermometer. If it is not cooked simply put the lid back on and return it to pressure for 6 more minutes, or until fully cooked. Thanks Joanne, it’s very easy to cook it! I tried the one that uses no liquid but the pot never came to pressure, thanks for this recipe and the chart for timing, it makes it easier. Hi Kate, So glad it worked for you! I wasn’t sure I would like this as I love roast chicken, but I also love that this cooks so much more quickly, thanks for an easy recipe! Hi Beth, I’m so glad you liked it! This is the only way I’m cooking my chicken now as I’m pretty last minute and this works perfect for us. Was I supposed to tie up the legs? It doesn’t say to, but your picture looks like you did. If I want to cook baby carrots with the chicken, when should I add them? Hi Danielle! I would wait until the chicken is done, then quickly remove it as directed in the recipe and have your baby carrots ready to go in (in a steamer basket would be best) and then get the lid on quickly so that you don’t lose too much heat. I’ve not cooked baby carrots under pressure but I’d guess that you could cook them for only 3 minutes and that would probably be long enough, then you could do a quick release. I want to add whole carrots and potatoes cut in quarters, can they be cooked all at the same time with the chicken? you could potentially cook whole potatoes with the chicken and they might be ok, but the carrots will be mush by the time the chicken is done. Here’s what I do, once the chicken is cooked remove it and set aside and cover with foil to keep warm. Add baby potatoes and carrot chunks to a steamer basket and cook on high pressure for 4 minutes, you can then quickly release the pressure as soon as the time is up, if you don’t have a steamer basket you can try and put the potatoes and carrots on the trivet that came with the Instant pot instead. Hi Sheena. I’ve got a stainless steel stove top pressure cooker and have been wanting to do a whole chicken in it. Since the stainless steel heats up faster than the instant pot, it’s my understanding that the cook time will be shorter. Do you have any idea as to what the different times might be for your weights from your chart? Thanks for asking, I should say I’m no expert in stovetop pressure cooking but it’s my understanding that the thing that makes the difference in cook time between any of them is the PSI, or pounds per square inch of pressure rather that how hot it heats up. 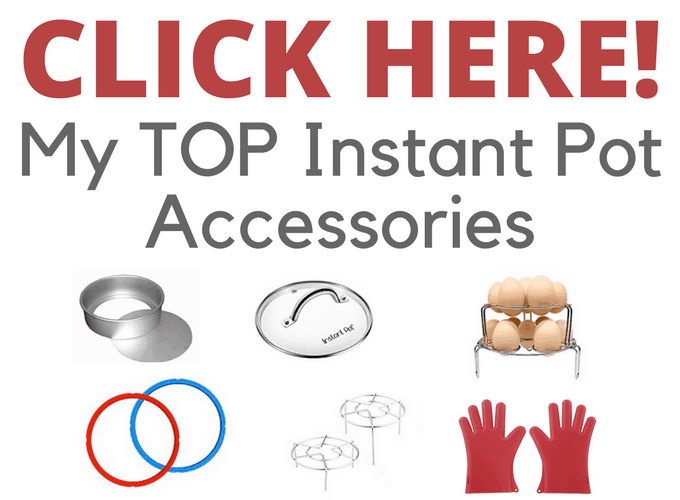 Stovetop pressure cookers generally have the highest PSI and the mini versions of some electric pressure cookers (Instant pot makes a very small one) have the lowest PSI, with most of the other electric brands being in the midddle. So all that to say, I would simply shave off 5 minutes from any of the timings in my chart and see if it’s cooked using a thermometer, I think that should be long enough. if it’s not cooked at that point, just cook it for a few minutes more at pressure. Thanks so much Jim! If you come back and let me know your findings I can add it to the post. Hi Sheena. Whole chicken cooked well. Fearing I might burn the chicken because there is no trivet with the stovetop cooker, I added an extra half cup of water. That might have been too much as I ended up with about two cups of fluid remaining in the bottom of my pressure cooker. But when life gives you plenty of liquid, make a gravy…so I did. Tasted good too because of the extra spices that sluffed off the chicken during cooking. I also let the cooker depressurize for 12 minutes like you suggested. I suspect I could have gotten away with releasing the pressure quickly (I’ll try that again another time). All in all, that chicken not only provided me with supper but three lunches as well. I cooked up some asparagus and broccoli to go with it. Thanks for the recipe. Looking forward to others you come up with. Hi Jim, much appreciated and thank you so much for such a detailed response! And like you I also need to try it by releasing the pressure quickly and see what happens. The received wisdom is that will make the meat tough, but I need to try it and see if it does.